For clean, comprehensive carbide removal, use a carbide grinding wheel manufactured at Eagle Superabrasives, Inc. The advanced bond systems, exclusive formulations and experienced staff at Eagle Superabrasives has made us a leading supplier of superabrasives in the United States. Tungsten carbide is a chemical compound made up of equal parts tungsten and carbon atoms. When in it’s most basic form, tungsten carbide is a fine, gray powder. It’s then pressed and shaped into tools, abrasives, industrial machinery and even jewelry. Because it is nearly twice as strong as steel, tungsten carbide can only be polished with super abrasive materials like CBN and diamond powder wheels. And at Eagle Superabrasives, we put care into manufacturing each carbide grinding wheel to ensure its superior abrasive qualities. 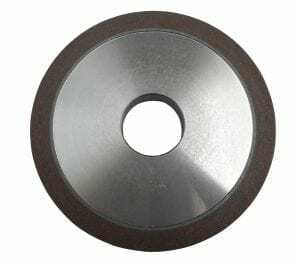 Our carbide grinding wheel is almost a necessity in a variety of industries where tungsten carbide is used. This includes in the manufacturing of ammunition, creation of sports equipment like hiking poles, or making surgical equipment. The carbide has also become popular among jewelry makers, due to its extreme hardness and high resistance to scratches. In addition to being ten times harder than 18k gold, carbide also gives off a high polish. Our Pro Flute 3 is a superior carbide grinding wheel. The wheel features a metal hybrid bond and diamond abrasive. With 220 grit and an overall thickness of 6mm, the wheel is ideal for wet carbide grinding. It removes carbide quickly and cleanly, increasing your productivity and saving you time and money. Our CDX wheels are also specially formulated to grind tungsten carbide and steel. These wheels use both diamond and Borazon powders. Carbide inlaid knives, special tipped tools and Bac Pac systems can be ground with ease without the wheel suffering from thermal damage or wheel loading. At Eagle Superabrasives, we stock over 6,000 wheels at our Hickory, NC location. For this reason, we can ship most of our products same-day. And we can complete custom orders in as little as seven days. For all your superabrasive needs, contact us today!